Unfortunately, the image of God present in many Christians’ minds today resembles more of a caricature than an accurate portrait. Like a cartoonist’s sketch, some entertain a distorted picture of who God is and what He is like, with many relating to Him as a distant Deity or even as a faceless Force. Others see Him merely as a compassionate, caring, and convenient God. Worse, false teachers have also infiltrated the Church. Many deny core truths, reimagining God to fit their preferences. This flawed, idolatrous understanding reduces Him into a deity that exists to serve us and our needs. But the God of Scripture exists independent of our thoughts, feelings and ideas of Him. He is not as we imagine Him to be, but rather who He declares Himself to be in Scripture. This biblical knowledge is the very basis and beginning of authentic worship. It is through this heavenly understanding that we come face to face with the real God, discovering and experiencing what worship was meant to be! With author, speaker, and veteran Bible teacher Jeff Kinley as your guide, journey deep into God’s Word, where you will encounter not only a refreshing simplicity, but also a renewed level of intimacy with your God and Savior! 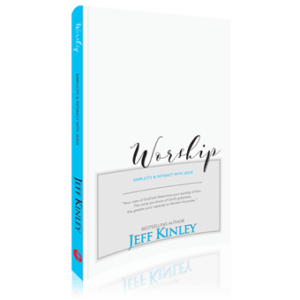 Best-selling author Jeff Kinley is passionate about communicating God’s vintage truth to this generation. Following a tumultuous teenage experience, Jeff was led into a relationship with Jesus Christ, and everything changed. Once told by his high school English teacher, “Jeff Kinley, you will never amount to anything in life!,” Jeff went on to have a successful pastoral ministry and to write over 25 books, becoming a nationally-known speaker. Jeff’s experience and expertise in explaining God’s truth is well-known. He has been a featured guest on such shows as Fox&Friends, The GlennBeck Show, The Ben Shapiro Show, and hundreds of national radio and television programs. Jeff served for over two decades as Student Pastor at churches ranging from medium-size to mega-church size. In 2000, he founded Main Thing Ministries, a non-profit organization whose mission is to equip and inspire Christians to become life-long followers of Jesus Christ. He is a graduate of the University of Arkansas (BA) and Dallas Theological Seminary (ThM). Jeff and his wife have three grown sons. Jeff plays guitar, enjoys traveling, a good cigar and knows more about the Beatles than any 10 of your friends combined.